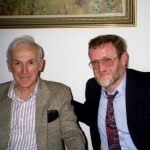 The rest of this page is mainly devoted to an appreciation of Prof Hedley Beare with whom it was my privilege to work for five years (1989-94) at the University of Melbourne. Together we wrote Education for the 21st Century (Routledge, London, 1993) which was warmly received by the teaching profession in Australia at the time. 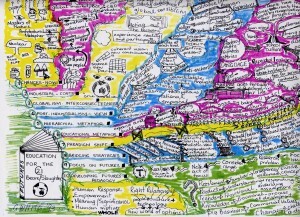 Mind map of the original Education for the 21st Century, from 1993. This image was produced by G. White. It’s interesting to see some of the major themes of the book illustrated graphically. This device makes it possible to gain a conceptual overview very quickly. 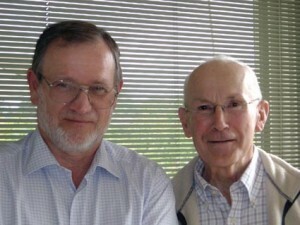 I first met Hedley Beare when I came to Melbourne to address the Futures in Education conference during November 1986. Like many others I was immediately struck by his geniality and openness, his quiet manner and generosity of spirit. He was someone you immediately trusted and knew you could rely on. 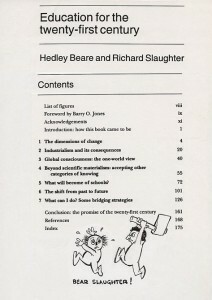 So it was with enormous pleasure that in 1989 I joined his Department at the University of Melbourne as a ‘lecturer in futures and social education.’ Unlike many, then and now, Hedley understood the rational for this particular description and, furthermore, did everything he could to encourage and support it. As professor the demands on his time sometimes seemed endless. So, as time went by he would therefore occasionally ask me if I could fill in for him when he was too busy to respond to a particular speaking engagement. It was always an honour to do so. One of the things that most stood out about Hedley was the way he so consistently sought to promote and support his colleagues. I’ve met very few people – in academia or elsewhere – who have this kind of genuine, in-built concern for others. But this quality shone forth in Hedley and, as a result, the rewards of working with him were considerable. For example when he was hosting some particularly interesting visitor for lunch, he’d also invite one or two of us to join them. He also knew how to throw the conversation open so that you always felt valued and included. After a couple of years a conversation began to develop between us about how education could be framed so as to become more forward looking, not just in rhetoric and generalised intent, but also in on-the-ground practice. We’d both been speaking along these lines and, in his words ‘workshopping’ some of the ideas about how that could occur. So it seemed a natural step to begin thinking about writing a book that would be clear and accessible, bringing these ideas and suggestions for practice together. 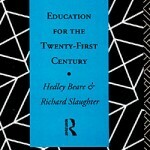 The result was Education for the 21st Century, which was published in 1993. With his extensive networks in Australia and overseas and also the respect in which he was universally held, the book received wide publicity and unusual acceptance within the profession. Working with him on the book was a delight. We started by deciding which of the eight chapters (including the conclusion) that each would write. As one was drafted we’d hand it over to the other with a free hand to review it and make any changes at all. So we effectively edited each other’s work. The arrangement worked perfectly because we were fundamentally in accord and the issue of contending egos simply did not arise. Hedley’s sense of humour is evident in the flier reproduced here, as is his considerable artistic skill. We were both delighted at the response – and the sales – that the book generated. In my case its success also meant that I could move on from being a newcomer, an ‘unknown quantity,’ so far as the publisher was concerned. This opened the door. Over time it led to the establishment of a Futures in Education series and the publication by Routledge of several other works by emerging authors. In late 1991 or early 1992 we received a visit from member of SEAMEO (the South East Asia Ministers of Education Organisation) and were subsequently invited to go to Manila in June 1992 to take part in the wrap-up of a large-scale Delphi survey. To my surprise I was asked to chair the ‘expert panel’ and Hedley was one of its distinguished members. We worked hard for a couple of days and then were treated to a brief tour of the sights of Manila, some of which were described as ‘another of Mrs Marcos’ projects, and one of which was a vast war cemetery. During this excursion we made the classic mistake. It was a hot and humid day and we were expiring in the back of the car. Our hosts, with every good intention, bought us a couple of cold drinks that we soon had cause to regret. I don’t know how long Hedley suffered the consequences but I was still managing the symptoms a week later. Overall, my time working with Hedley was one of the high points of my career. For the first time I felt part of a team that was going somewhere. I was in demand from schools, publishing in professional journals and beginning to write books of my own. April 1993 saw the first iteration of the Knowledge Base of Futures Studies and The Foresight Principle was drafted soon thereafter. But this happy period was not to last. Hedley and I stayed in touch. We co-presented at a conference in Canberra and often exchanged ideas and papers. 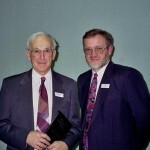 He was delighted for me when in 1999 I was appointed Foundation Professor of Foresight at Swinburne. We met from time to time. But I particularly recall meeting in an Italian restaurant in Lygon Street sometime in 2004 to exchange our new books. I gave him an inscribed copy of Futures Beyond Dystopia. He returned the compliment with Creating the Future School. In more recent years we discussed the possibility of writing a follow-up to our earlier work. But as his health declined and my workload increased we were unable to do so. I last saw Hedley at his home in 2006. Lyn provided tea and biscuits. Hedley had already survived several bouts of ill health. He spoke about perhaps ‘having time to do about a thousand things,’ indicating that he felt time was closing in on him. I last spoke with him by ‘phone when he was back in hospital during August 2010. He sounded weak but not bowed. He spoke about the desirability of our work outliving us. I, in turn, promised to respect what we’d done together and to perhaps give it a new lease of life in due course. He died at home on September 5th, 2010. There are very few people who stand out above the rest, whose very existence makes other lives brighter and more productive. Hedley was indeed one of the rare few and I’ll always be grateful. Working with him remains one the highlights of my own life and his legacy will endure for many years to come.